This morning I'm going to try a blaster box of the dreaded Black Diamond. I often hesitate to buy this product, but to keep things interesting on Retail Review I usually pick one up when I make a big order of retail products. My hope is that one day I will actually pull something good out of a box of it. 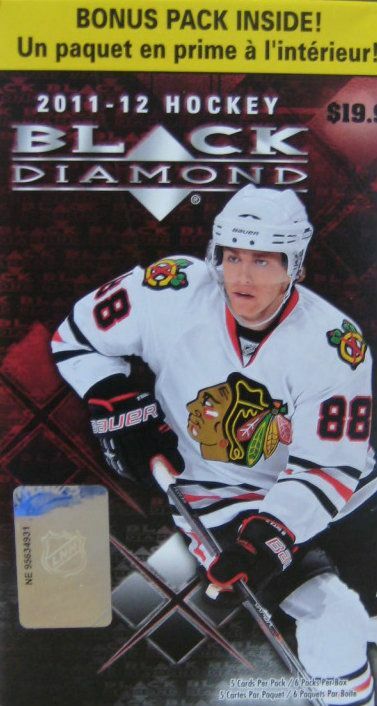 Black Diamond is now a super premium product, but back in 2011 it was semi-similar to Upper Deck Series 1 and 2. I'd say it was a little above it in terms of Upper Deck's hierarchy of products, but not higher in terms of collector interest and love. Black Diamond contains single, double, triple, and quad diamond cards. This tiered system of rarity was very popular when Black Diamond first hit the scene, but now getting a nice quad diamond card isn't too exciting. I'm not sure what I'm hoping to get in this blaster box. I guess it would be a hit, but that's a tough call as hits are very hard to come by in this product at the retail level. Surprise, surprise! It was actually pretty awesome to pull a hit out of this blaster box. Hitting a memorabilia card out of Black Diamond is so tough! I was very happy to get one out of this box. The rest of the cards were decent as well. Besides the hit I was able to get a double diamond of Vincent Lecavalier, a triple of Brad Marchand, as well as a triple diamond rookie card. All in all this was a good break for Black Diamond. My single diamond pull of Ryane Clowe was something I considered for my top three, but he just narrowly misses it. The Great One is just a single diamond... but I think this year Upper Deck chose to put the biggest names as the easiest pulls. 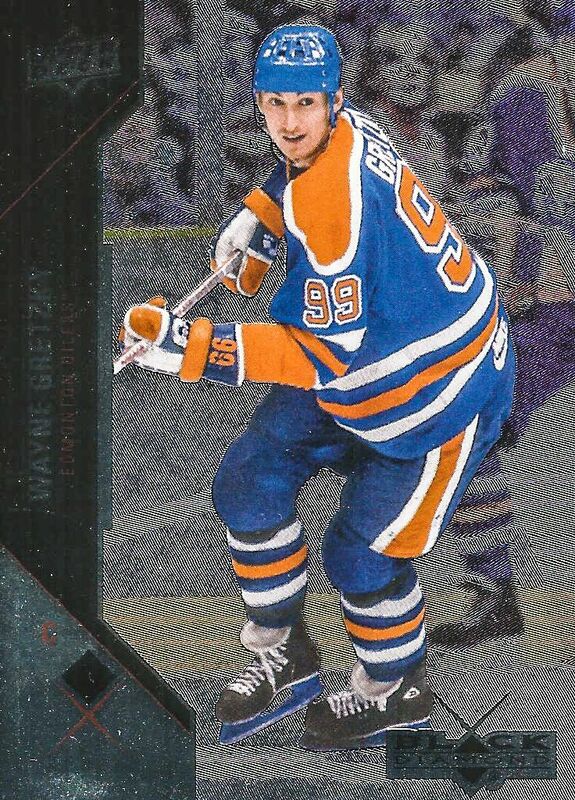 Pulling Gretzky cards is always a good thing for a hockey card collector. 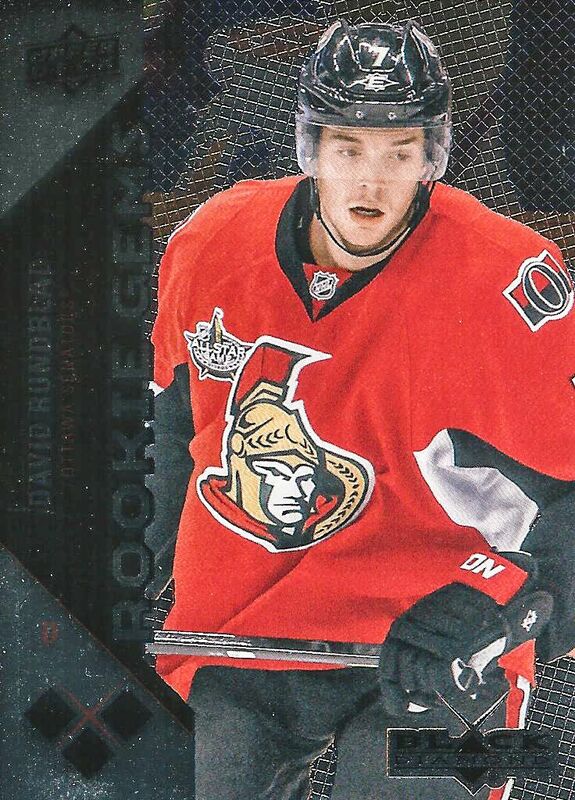 The only Rookie Gem I got was this David Rundblad triple diamond. The Rookie Gem cards are nice looking. It's just too bad that they are not as popular as Young Guns are. 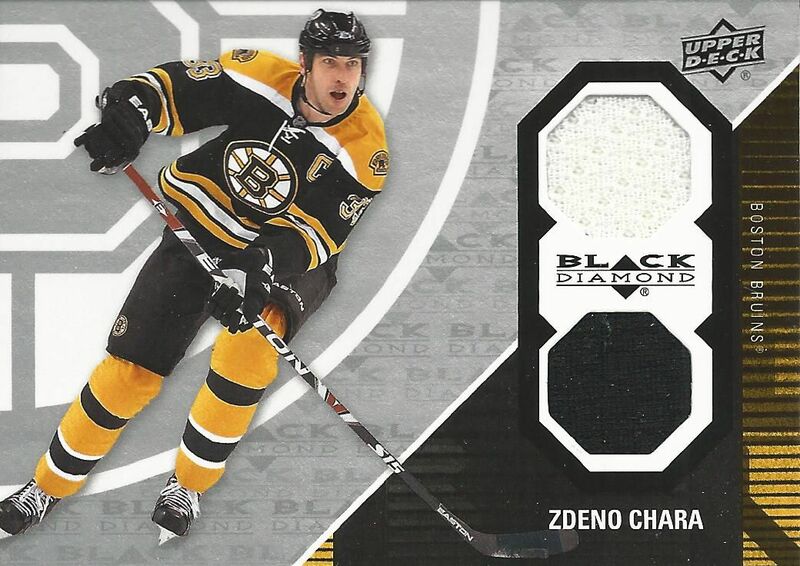 It was really awesome being able to pull this double jersey of Zdeno Chara. I think you got 2 of these per hobby box, but in retail they were hardly seen. Chara is a very good hockey player and it was nice to find him today. I have to say that I got pretty lucky with this blaster of Black Diamond. You really don't get a jersey hit in those very often. I can say that this blaster was worth it as not only did I get the dual jersey, but some other nice cards to enjoy as well. This blaster doesn't make me change my mind about getting Black Diamond blasters, but it does give me hope that not all of them are duds. There can be good ones out there! Let me know what you thought of my 11/12 Black Diamond blaster box down in the comments below. Have you ever gotten anything good from a Black Diamond blaster? I'd love to know! I really like the etched look of the Black Diamond cards...wish they scanned better but in hand they look great!